To anyone who visits the Westlands Water District (the District), the one reality that is most obvious to the observer is that agriculture IS the economy in the communities within and immediately surrounding the Westlands Water District. It is an area characterized by wide open fields-often populated with crops and occasional small pockets of residential and (rarer) retail-usually at the intersections of roads. Not only is agriculture the primary employer, but government, agricultural support industries and the limited general retail sector comprise the full course of jobs within the district and its immediate environs. Nearly every business in the district is related to agriculture or supporting the needs of the workers who support those working in agriculture. Westlands Water District is perched on the eastern side of Interstate 5 in the Central Valley covering the geography between roughly Kettleman City in the south and Firebaugh in the north. As the largest agricultural water district in the nation, it plays a central role in the economies of both Fresno and Kings Counties. 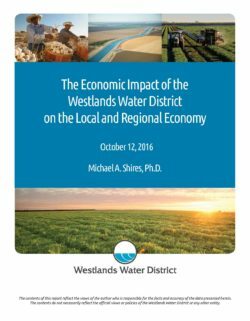 This analysis unravels the story of Westlands' contributions to the local economy, exploring the demographics and economy of the region, agriculture's major role in that economy, estimating the economic contributions of growers within the District's boundaries, and providing a preliminary assessment of the consequences of current water policies on crop production, and giving a preview of what some of the implications of those changes may be. Westlands Water District (WWD) directly accounts for nearly 29,000 jobs and $3.6 billion of economic activity. Sustaining domestic production of fresh fruit, produce and nuts serve critical national priorities, including National security, environmental protection, worker protection, providing workers with reasonable wages, and using scarce water resources efficiently. 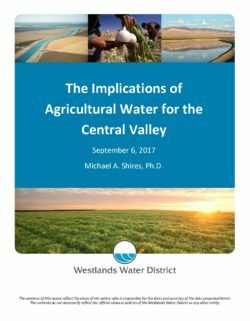 In this analysis, the research focuses on the implications to the local economy and communities of the agriculture-driven jobs that Westlands and other water districts in the region foster. Consistent and ongoing provision of the full allocation of water to WWD would result in a 19.9 percent increase in employment and more than a 17 percent increase in economic output from WWD alone. Providing none of the allocation to the growers in the WWD (through either policy choices or a long-term drought) would result in an 80 to 86 percent decrease in both employment and economic output in the district. This would represent 25,000 to 27,000 jobs and more than $3.0 billion of economic output in the local economy. In the presence of a long-term water crisis in the region, the economic impacts for Fresno and Kings Counties would be major. Agriculture directly contributes to (conservatively) one in six jobs in Fresno County and one in five jobs in Kings County. It accounts for at least one-sixth of the economic output of Fresno County and nearly one-fourth of the economy in Kings County. For solar construction to replace this level of employment in the county, more than $6.24 billion dollars a year would have to be invested in new solar projects within the county’s boundaries. Agriculture provides employment, income and opportunity to a wide range of workers in the region with extremely limited education and training. More than half of agricultural workers have less than a high school education and 95 percent have no college. Agriculture does provide a path for social mobility with opportunities to advance and earn significantly higher wages, even for these low skilled workers. Almost 90 percent of the workers who would be displaced by disruptions to the agricultural sector in the Central Valley are Hispanic. Communities that show success in attracting manufacturing have much better educated labor pools. o For those that remain behind, they would change from being net contributors to the local economy to recipients of public resources through the social safety net. Expand the water resources available in the state through conservation, desalinization, and recycling. Agricultural production is a national security asset—especially in today’s uncertain global trade climate, it is essential to have a reliable and accessible domestic food supply. There are a limited number of places where the climate, soil and space overlap as they do in the California Central Valley to produce an ideal climate for agriculture. Not surprisingly, California’s irrigation technologies are increasingly among the best in the world. Add to that the state’s stringent environmental regulations on the use of pesticides, worker protections, and food handling regulations, and the state’s food supply is among the safest in the world. Once the land that supports this critical national asset is dedicated to other purposes, and once the industrial infrastructure that supports the processing and distribution of these crops are gone, they are almost impossible to rebuild. All it takes is enough water to make it work—a problem that humans have been solving since the first patch of crops were planted in prehistoric times. With the technologies available, we should be able to solve it today.